A brightly colored one-pot meal for our first blustery winter day of snowy ground and gray sky. Sprightly hues and sparky fresh ginger made this a perfect antidote to a dull day. Besides, making another tasty meal based on legumes is part of my resolve to prove that a diet of dried beans, lentils and other nitrogenous vegetables doesn’t need to seem like a sentence. You see, my husband’s doctor insists, and he resists. He’s too young to be a statistic. So far, however, the gorgeous Christmas limas with cabbage and sweet potatoes, the curried chickpeas with mushroom, the lentil soup with chard, and now this, turn out to surprise him with flavor, texture, and looks. Can’t discount the looks. He said the lentils looked like mud and, well, they did, so here I went in the opposite direction, seeking the most colorful and flavorful combination. The snowy white peas with their black eyes and the school-bus-yellow squash made a great-looking duo. I dulled the dish a little by adding much more tomato puree than the original recipe called for, but we were eating this as a main dish with a simple green salad, so I wanted the flavor and liquid. Everything here is local except for the black-eyed peas and the dried spices. The recipe comes from At Home with Madhur Jaffrey. I have to agree with Deborah Madison’s review of the book that says that “If I folded pages, every page would be turned down, marking a dish I just have to make, and soon.” I’m cooking my way through this inspired cookbook (as well as My Bombay Kitchen by Niloufer Ichiporia King), trying to decipher the seasonings of the Indian sub-continent. They’re great companions for a flavorful leguminous diet. Soak the black-eyed peas in plenty of water. Drain before using. Pour the oil into a large pan set over medium-high heat. When hot, add the cumin and fennel seeds until the start to sizzle, about 10 seconds. Add the onions and cook until they start to turn brown at the edges. Add the garlic, ginger and chili and then the tomato puree. 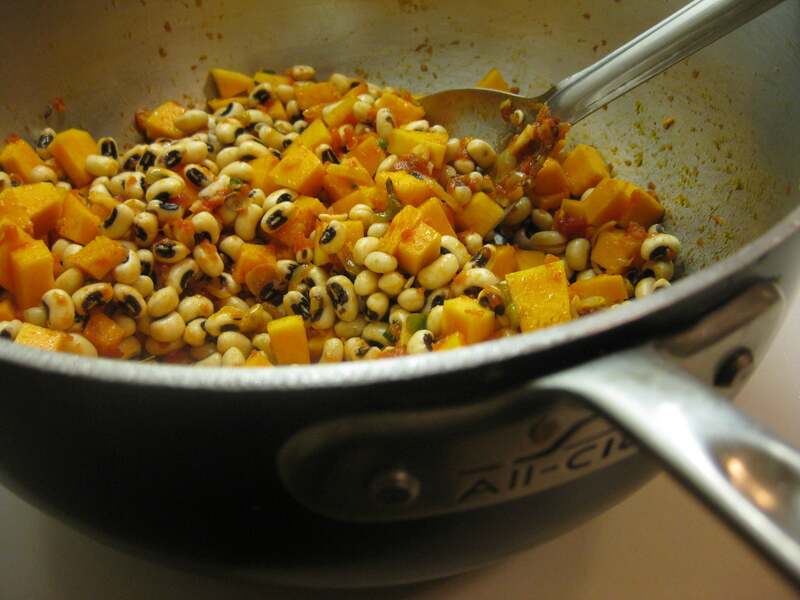 Add the black-eyed peas, salt, cayenne pepper and 2 cups of water to start. Bring the mixture or a boil, lower the heat and cook, partially covered for 30 minutes. Add the squash and continue to cook for about 30 more minute, or until the peas and squash are tender and the water is absorbed. You should check on the mixture from time to time and add more water if necessary. Serves 4-6 depending on whether it is served as a main course or a side dish. We ate a riff on this heavenly recipe last night, NUM. Have you dared to venture over to Madhur Jaffrey’s World Vegetarian book? It is the most epic compilation of creative, nutritious recipes I have ever seen. It’s my go-to Bible for grains, beans, and legumes. Yes, I like her World Vegetarian book and you’re right that it’s epic! I made some really good condiments from it a while ago… something like lime pickle. I’ll have to go back for the beans and other legumes now that we’re trying to boost that part of our diet. Good idea, thanks. Thanks so much for spotting this. I deviated from Jaffrey’s method and added the squash about halfway through cooking instead of at the beginning as she did since I thought it could become mushy if added too early. I corrected the recipe. It’s funny that you looked at this now. 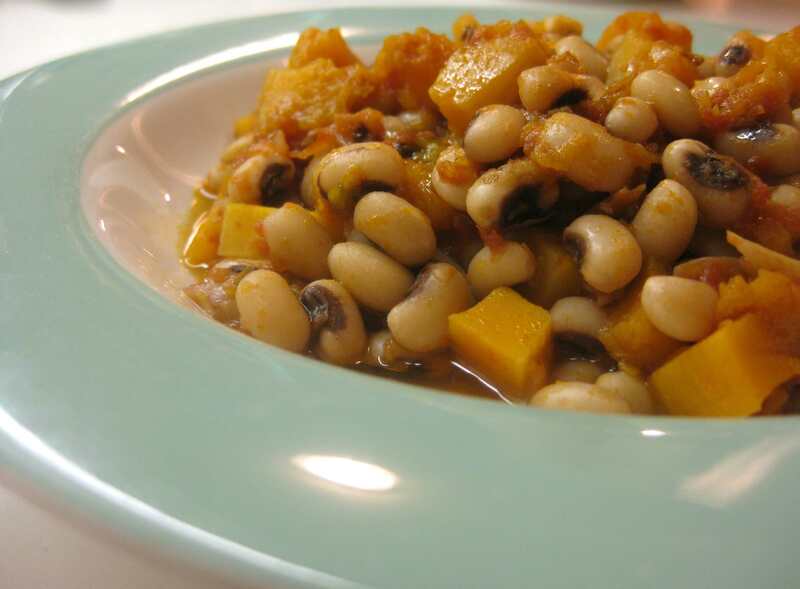 I’m cooking my way through a huge (28 lb) Blue Hubbard Squash and this is one of the dishes that was on my mind. Hope this works our for you.